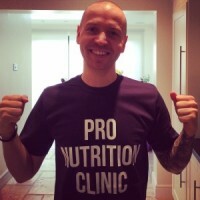 Hi, I’m Paul O’Neill the owner and coach at Pro Nutrition Clinic, I’m passionate about healthy nutrition and using real food to achieve optimal health and performance. Through my personal coaching programs and helpful information I’m on a mission to help, educate and empower 1 million people to a healthier more fulfilling lifestyle, whether that be with weight loss, fat loss, muscle gain or healthier food choices for the whole family. I understand the frustration of following all the latest diet advice and seeing no change to your weight or the way you look. Not only have I grown up watching my parents struggle with weight problems but I too have been on my own journey with weight and battling the numbers on the scale. That didn’t change until I threw out all I was being told about weight loss and started listening to my own body. 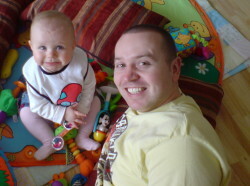 Here I am at a healthy 14 stone (196 lbs, 88.9 kg) playing on the floor with my oldest daughter. I say healthy because at the time I was following all the advice to stay fit, healthy and slim. Believe it or not I was exercising 5, 6, sometimes 7 times a week, I was running, lifting weights, going to spin classes and counting every calorie I ate just to maintain that 14 stone. I always thought it had to be down to my genes and that was just how I was meant to be, right. WRONG! If bordering obesity wasn’t going to kill me then the chronic over exercising was, something had to change and luckily it was my mindset. I decided to throw away everything I knew about dieting and started listening to my own body and the result was astonishing. Here I am at a much healthier and happier 10 stone 5 pounds (145 lbs, 65.7 kg), ironically I do half the amount of exercise I did before and enjoy mountings of real food. Let me do the same for you. The diet industry is littered with one size fits all diet plans that don’t work. Just eat less calories to lose weight, eat low fat to lose your big belly and bum. We see all these fad diets for what they really are. Myth. Here at Pro Nutrition Clinic we take each and every person as an individual and provide diet and nutrition advice tailored to you and only you. We know there isn’t anything more individual than your DNA, so with the help from our friends at DNAFit, we offer a 60-second saliva DNA to see how you respond to diet and exercise, as well as our comprehensive 8-week online program. Whether you’re an office worker looking to shift that stubborn belly fat, a house wife looking for more energy or a professional athlete looking for optimal performance, we can help. • Why am I dieting and not losing weight? • I just can’t shift that stubborn fat around my belly? • I’m spending 7 days a week in the gym but my physique isn’t changing? • Why am I always hungry? • I’m training but my performance isn’t improving? • Am I eating the right foods? • Should I be counting calories or not? • Low carb, low fat, I don’t want to be on a fad diet? • Will I have to starve myself to lose weight? “ Pro Nutrition Clinic has a top class set up made very easy. Myself and my partner both live busy lifestyles and these programs are easy to record and follow.